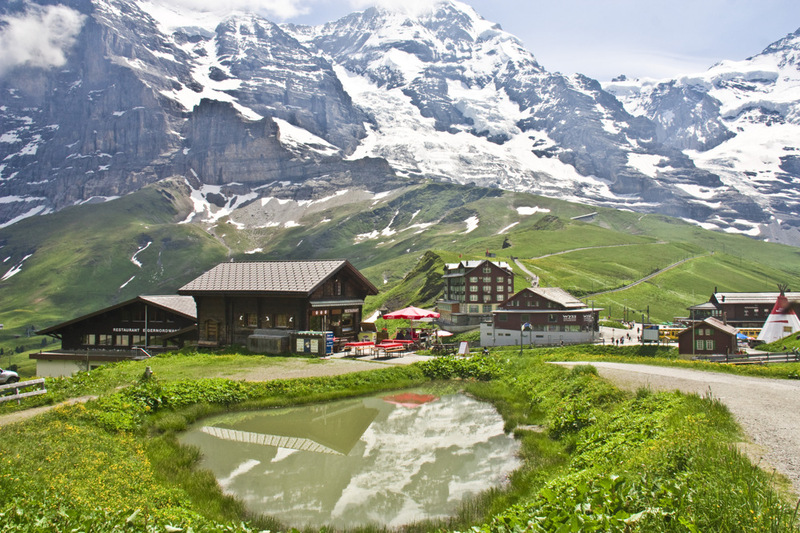 The train station at Kleine Scheidegg is on the right, as I stand. Seen below is the north face of the Eiger. Stunning vistas Ayush! What really grabs my eye is the reflection of the clouds in the house in the little pond. Excellent captures. Seems an odd place to sight a wigwam, Ayush. The first shot is fantastic with that reflection. I like that second shot as well with that map included. WOW! That's just incredible! It's like everything you always dream it will be! What a fantastic & dramatic view this is! Ah the fearsome Eiger, with its even fearsomer North face. I was in awe at that name as a child Ayush. Ayush Basu: Its insane that's what it is Chad. In my opinion people who climb this face, have a segment missing in their brains, the segment that process logical and rational decisions! Great picture Ayush....what's with the wigwam?? Ayush Basu: Beats me Bill. It seems to be very close to the platform and you can make out the train behind it. my gossh Ayush! did you finally open a bank account there? The small pond adds a lot to this shot with it's reflections. Very nice all around. Such majestic landscape, Ayush. Talk about having your head in the clouds. The wigwam has aroused my curiosity also. Ayush Basu: I confess I am not sure about its origin or purpose. It seems to be very close to the platform and you can make out the train behind it. A place I would love to see,Ayush,I have read so much about it. Ayush Basu: Then perhaps you'll make a trip there after the US one ? I'm almost speechless Ayush, what magnificent scenery. A delightful scene. Like the reflection you caught in the water. Very nicely framed with the reflections Ayush! Unfortunately the day was overcast and cold. Your pictures and weather are perfect. I can't wait for when we start the ascent up the North face Ayush. Ayush Basu: Haha good one Chad! The mountains are just spectacular. Just the place to have a beer and breathe mountain air. Ayush Basu: You are very correct Louis, it doesnt get much better than this. It really is idyllic, Ayush! Ayush Basu: Isn't it? Thank you very much Ginnie. I like the refection of the mountains in the pond but even better in the little cafe. I've climbed the Eiger... albeit in a train inside the mountain! Ayush Basu: Thank you very much Alan. Then perhaps you could share some of your own shots as well, someday? What a great shot of this classic mountain face. The epitome of the Alps, Ayush. It's stunning. A great pace for mountaineers and a wonderful place for hikers, like you. Wonderful, a great place to visit.